How do I swap Ctrl and Alt in just the Terminal? I have a USB keyboard where I swapped my Cmd and Ctrl keys, because I come from the world of Linux and that's just what I'm used to. However, this causes a problem in the Terminal because all of a sudden the Ctrl key (used for escapes and whatnot [^C, ^D, and so on]) is in the wrong place. As a result, I keep accidentally pressing the wrong key. Is there a way to swap my Cmd and Ctrl keys again only in Terminal (so that the keys are all in the right place)? 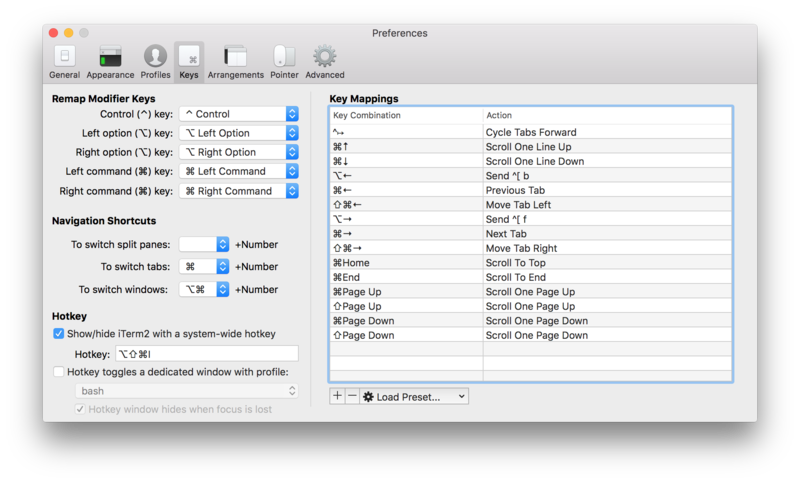 iTerm2 will let you remap your modifier keys. This has the effect of just remapping them for terminals. Bonus: it's also a better terminal program for OS X than the built-in Terminal.app that ships with OS X. You can alter the modifier keys on a per-profile basis as well. That lets you switch profiles for terminals depending on what you're doing with the terminal so you get the correct behaviour for local and remote sessions. You may find "Karabiner" app to fit your needs. I have used this app for similar reasons as to swap keys with modifiers. You can do a filtered search for "terminal" or "Command_L" to specify the effect you are seeking. Not the answer you're looking for? Browse other questions tagged terminal keyboard . Why do Ctrl+F2 and Ctrl+F3 sometimes stop working? How do you position your hand to press Command (cmd) + Option (alt) keys? What is the CTRL+x+e equivalent for MacOS's Terminal?